Are you looking for a Organic Snack for the little ones? With only real ingredients that are used. 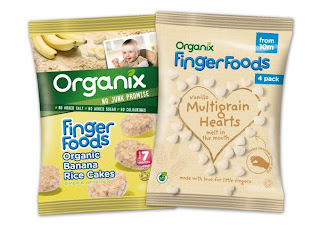 Organix has launched two new baby finger foods. Organic Banana Rice Cakes and Vanilla Multi-grain Hearts. They come in multi-packs which are ready, easy and handy for your little ones to enjoy. They make great snacks on the go or are great for little ones to eat in between meals. 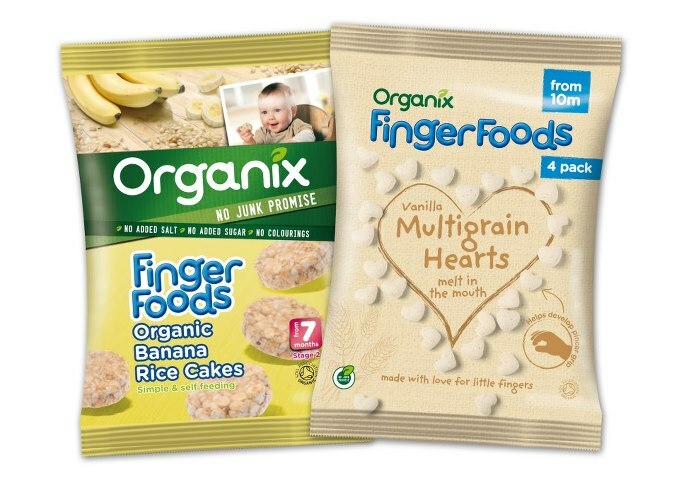 Maxwell was recently sent some snacks to try, he has been eating more interdependently recently and loves to feed himself so I knew before we even received the finger foods he would enjoy them. First we tried the Organic Banana Rice Cakes. The rice cakes come in quite big bags which means they are great to have at home for a small snack in the day, or to give after a meal. 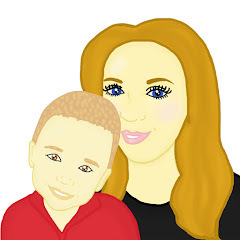 They are suitable for children who are 7 months and over and are designed to encourage babies to develop more complex self feeding skills. Maxwell really enjoyed the Rice Cakes. When I tasted one they tasted sweet. The rice cakes also didn't crumble. We thought that the shape of them were perfect as he was able to pinch them with his fingers instead of grabbing them in his palm. Overall these were a huge hit. Maxwell then went on to try the Vanilla Multigrain Hearts. The Hearts come in small bags ideal for taking out with you for a snack. They have been specifically designed to support babies as they start feeding themselves at 10 months. They are a tiny size, but are the right size for babies that are looking to develop their motor skills. Maxwell liked the Multigrain Hearts. They tasted quite plain to me when I tried them, and Maxwell didn't seem to enjoy them as much as he had liked the rice cakes but he did eat some. Overall I would rate the Organix Snacks 4.5/5. Please visit http://www.organix.com/ for more products and information.